Our first Pro-Am beer based on the winner of our first homebrew competition. This West Coast style IPA utilizes the finest Marris Otter malt for a profound malt back bone to stand up to the aggressive hop profile. Fifteen different hop additions of six different varieties make this beer a truly complex and flavorful IPA. The beer pours a rich burnt sienna/tannish-orange color. Head is a foamy inch of off white, that turns into a film shortly there after. Citrus and pine are big in the nose (Citra hops?). Orange, pine, and grapefruit are there and that’s about it. Very enticing though. The taste is more of the same. It starts with grapefruit and pine, then a touch of orange, before finishing with some slight sugar. Well balanced and not too big or too overpowering. Mouthfeel is medium to light. It evaporates rather quickly and leaves only a touch of bitter behind. 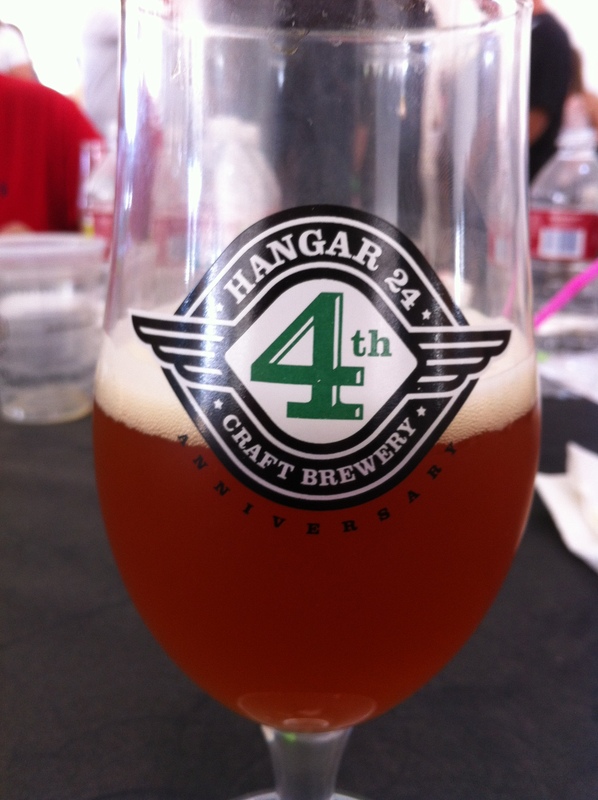 This “amateur” IPA can stand right up there with the IPAs brewed by the professionals at Hangar 24. However, the balance of flavor and drinkability was probably handled the best here. Not too shabby.